The Bat! is a powerful, highly configurable, yet easy to use email client. The Bat! is one of the most powerful and versatile email clients available for Windows, and it successfully combines a good security record with ease of use. The Bat! mail client has a lot of vital benefits and useful features that make your email experience simple and convenient. The Bat! allows you to work with unlimited number of the mailboxes, has powerful sorting filters, fully customizable message templates, Mail Dispatcher and many more other features. 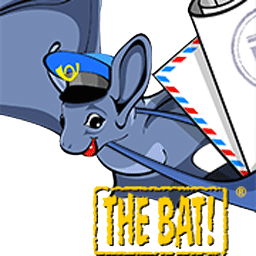 Unlike other email applications, The Bat! does not start scripts automatically. The Bat! benefits of its own HTML viewing mechanism – Robin HTML Viewer, as well as of its own image viewing module. These mechanisms protect you from viruses aimed at operating system mechanisms vulnerability. The pro version is an email client that offers secure authentication on POP3/SMTP servers using hardware tokens and transparent, on-the-fly encryption of the email message base, address books and configuration files. This makes the sensitive data stored on your mobile and desktop computers really secure. The internal PGP implementation, based on the award-winning OpenSSL lets you encrypt messages and sign them with digital signatures. Handy manager for digital keys included. Free plug-ins for PGP v5.5, v6.0.2, 6.5, v7.x & v8.x GnuPG is also supported. The Bat! also supports S/MIME via Internal Implementation or Microsoft CryptoAPI. The Bat! is the first e-mail client to support S/MIME compressed data. The Bat! support Secure Socket Layer (SSL) v3.1 / Transport Layer Security (TLS) v1.0 with AES algorithm.